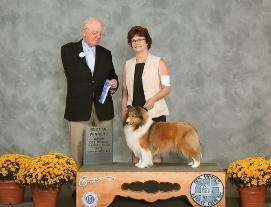 mentor me and I have been showing my dogs with the AKC. a few minutes to take a look at my four legged children. They are the loves of my life!! I would die for my dogs. They would die for me. Support the hobby dog breeder. We care for and study dogs all our lives. We care about beauty, soundness, and health. Courage, intelligence, spirit, and character. Great care in finding homes for each one. We are the ones you see at the dog shows. One of our dogs throughout its life. Money is not our goal. We hold the old ones in our arms as they leave us. We are the glorious past of each breed. We are the future of dogs.